Manhattan - Famed actor/singer Gianni Russo, best known for his role as Carlo Rizzi in The Godfather, had a surprise guest during his singing performance on Wednesday night at the swanky midtown restaurant and lounge Beautique. 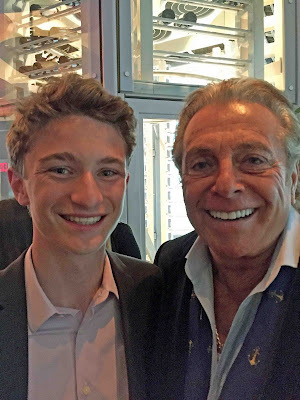 Russo, who is a favorite regular at the venue, invited 15-year-old Eric Traub of Woodcliff Lake, NJ to be part of his show. Traub, an aspiring young singer, sang Bill Wither’s “Ain’t No Sunshine” and Eric Clapton’s “Wonderful Tonight”. Although only a freshman in High School, the young Traub impressed the adult crowd with his rendition of the classic songs and received a standing ovation from the packed house.